Our pride and joy, the founders and main hogs of our herd. Horton was a fuzzy little 8 week old piglet when we brought him home ten years ago. He quickly exploded in size, packing on muscle and growing into the magnificent beast that he is today. One of the things we love most about Horton is his personality. He’s calm, laid back, loves the occasional belly rub, but for the most part minds his own business and hangs in the back. He’s attentive to his girls and offspring and so gentle that we use to leave him with them year round with the sows and piglets. We still would today, too, but now that he’s 10 years old it’s getting harder to keep weight off him. His offspring get his thrift and quiet calm temperament. He’s sired many piglets and his genetics run through the blood of some of the finest hogs in the country. Born 10 and a half years ago, Mayzie was our first American Guinea Hog. She’s very outgoing and almost prefers the company of humans over hogs. She’s got the beautiful classic Biggers build and coat. A good mother and doesn’t mind people being around her piglets at all. She produces big, fast growing piglets that mature anywhere from 250lbs to 400lbs depending on the gender. 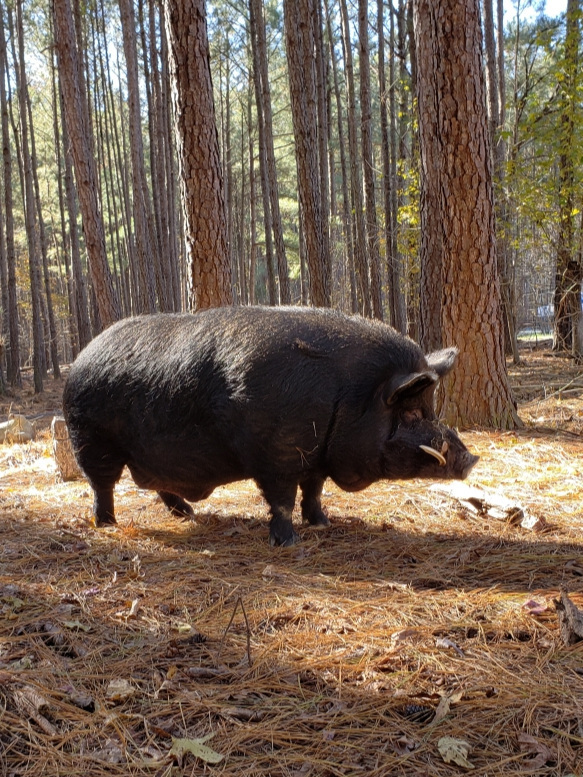 We’ve had one of her daughters grow bigger than our boar, Horton, but most of her daughters max out in the high 200s. Her sons’ weights are more predicable, usually around 350 to 425lbs. Will be 9 in February. We’ve retained several of Mayzie’s daughters throughout the years, most of which have been rehomed due to us needing to downsize, but Charlie will live out her days here. She’s friendly, but doesn’t actively seek out attention from us. Charlie is a very independent and intelligent sow, sometimes almost too intelligent. Her and her daughters’ mothering instincts are the best I’ve ever come across. In all her years of breeding she’s only lost two piglets, both times were our fault. She averages 8 piglets per litter. She’s never needed help with her piglets, and she prefers we give her space. She’s not aggressive and lets us handle the piglets, but she is protective. Superb foraging skills. When we turn her loose on fresh forage she gets fat and so do her piglets, all with little to no supplemental feed. Weighs 265lbs. Tina is one of Charlie and Horton’s daughters. She’s definitely inherited this line’s mothering abilities. Tina has never lost a piglet. In fact, if anything she gains piglets. She nurses any and all piglets, whether they’re hers or not. She’s a little stunted from getting pregnant way too young, and then getting pregnant immediately after three times in a row. Nursing every piglet on the farm certainly hasn’t helped, and with her milk supply and 14 teats she has enough milk for them all. Her offspring all turn out full size though.Tina isn’t a flopper, but she is friendly, curious, sweet, and very talkative.